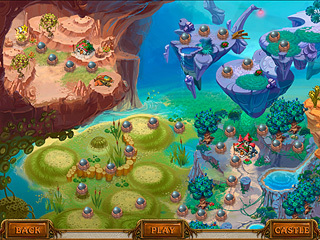 The saving and rescuing somebody usually happens in the hidden object puzzle adventure genre. 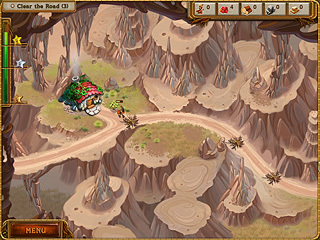 But this time you are to save the gnomes' kingdom in this strategy/time management game. A Gnome's Home: The Great Crystal has a cute story and graphics and a great mission to accomplish. The game is timed and the challenge level is high. You are to save the kingdom of the gnomes in A Gnome's Home: The Great Crystal Crusade. The underworld gnomes' kingdom was blooming and prospering while the magical crystal was shining. But after the crystal has been stoolen by an evil witchthe gnomes' kingdom lies in ruin. You have gnome workers to walk the long and hard path to gather the magical artifact, reach the lands of the evil witch, and defeat her to return the magic crystal and rebuild the underworld gnomes' kingdom. That is a lot of work as you can see. The bright graphics match the story well. On your journey, you have workers that clear roads, pick berries and chop down trees. You just mouse over the resources to collect them. And you are warned when you are running out of them too. The game is timed and the challenge level is high. It will take lots of hard work for the gnomes and you to get the gold. If the time runs out, you do have to restart the level.The game is very similar to mamy other road games with a liniar story development. The game is great even though it doesn't bring anything new to the genre. This is A Gnome's Home: The Great Crystal Crusade review. Download this game here.